Do you want to know what is so fantastic about this? Is Francis sending a signal to the Church universal? Is he rubbing traditionalism in the face of liberals? Is he throwing a bone to traditionalists? He&#039;s celebrating the the Church&#039;s sacred liturgy, at an altar, in the presence of the faithful. He&#039;s showing us that liturgy is not the proper forum for politics, ideology, taste, and preference. It is the Church&#039;s prayer, and we submit ourselves to it. Thank you, Adam. You have the best take of all on it. 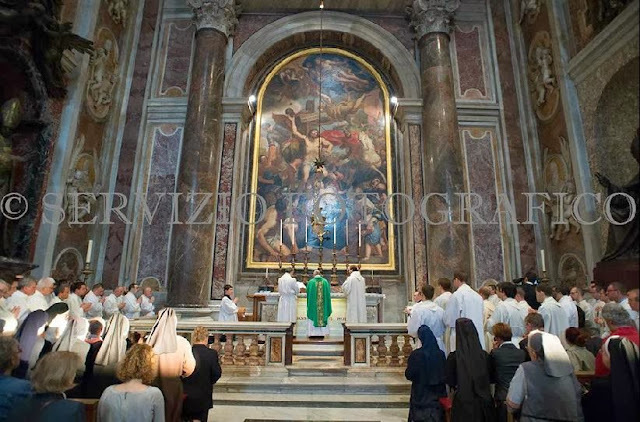 Although I do remember a time during JPII&#039;s pontificate when he would celebrate a private Mass at an ad orientem altar and (so it seemed) the Vatican was very careful not to release images of him actually at the altar ad orientem. The pictures would be of him sitting in the chair while a lector read or at a place when the rubrics required him to turn to the congregation, etc. Now, IMHO, too many people know that this is just a part of the Church&#039;s patrimony and it is not controversial. Progress, indeed! I am grateful to see this. Pope Francis does not demonize anyone. Thereby he sets a very good example for all of us. To my understanding this a first for him as Pope and hopefully will not be the last. Perhaps he is NOT hostile to liturgical traditions like we thought through he daily masses at St Martha&#039;s House. Or Perhaps he was suggested to do this by the Pope Emeritus. Who Know? I only saw Benedict do this once a year at the yearly Baptism of babies in the Sistine Chapel. We will have to see if he does it again than.